Star Wars' Rebel Alliance may have had justice on its side, but the Empire had some of the coolest-looking ships and designs overall. 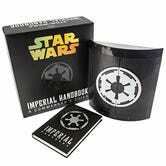 And now, a new book called Star Wars: Imperial Handbook includes some great-looking Imperial propaganda. We've got an exclusive sneak peek. From the book producers who unearthed THE JEDI PATH and BOOK OF SITH comes the newest book from a galaxy, far, far away . . . . a guide for Commanders of the Imperial Military. 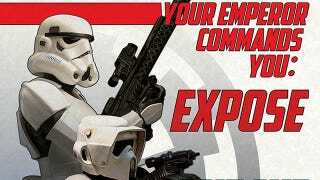 The Empire has taken hold of the galaxy. Soon, with the completion of the Death Star, its control will be absolute. In preparation for this Imperial expansion, high-ranking officials from each branch of the Imperial military have set down tactical guidelines and procedures as well as collected mission reports and classified documents for all newly ascending commanders. In the wake of the Battle of Endor, members of the Rebel Alliance intercepted this top-secret instructional manual and have circulated it among their own commanders, who have added notes and commentary in the margins.